Collins Booksellers - Supply Chain Strategy at Zophin Pharma by Chuck Munson, 9780133758566. Buy this book online. 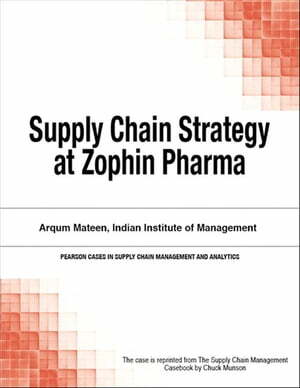 This new case study reviews supply chain strategy at Zophin Pharma, a major global generic drug manufacturer seeking to strengthen its presence in its domestic Indian national market. It reviews issues such as building effective local distribution channels, responding to tough price-based competition, improving plant manufacturing performance, and more. Focusing on realistic issues and challenges, this case study offers exceptional value to both students and practitioners. Author: Arqum Mateen, Indian Institute of Management.